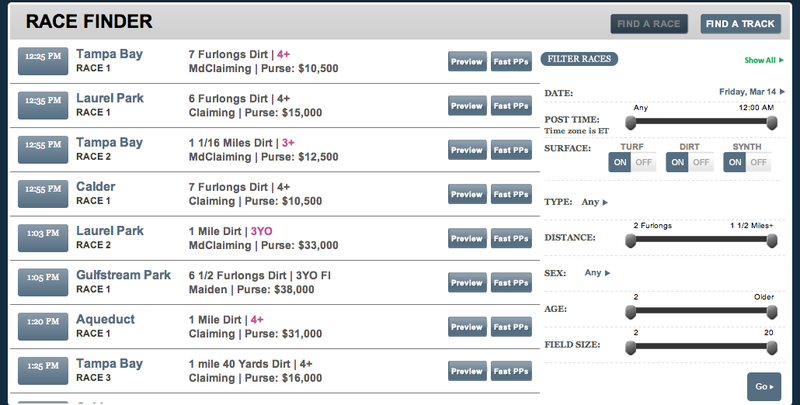 The Race Finder tool makes finding the races you want to play quick and easy. 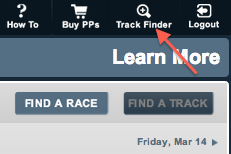 To access Race Finder click on “Find a Race” on the Main Page or the Track Finder page. Using the Date menu and the Post Time slider will allow you to find the races running in the time frame you are available to play. 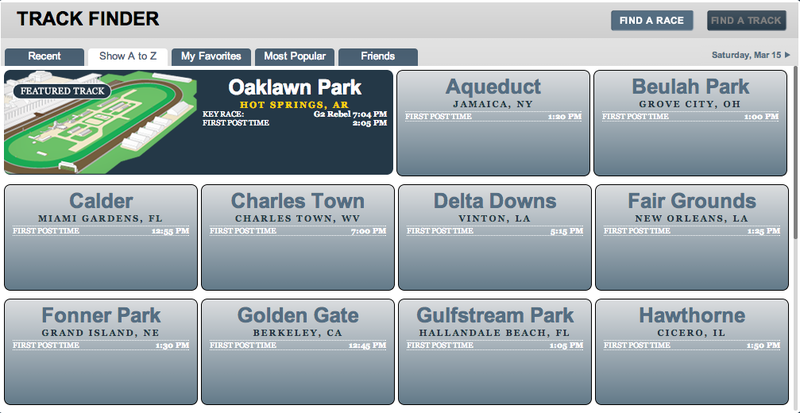 The example on the right shows the filter set for races scheduled in the time window from 5-8 PM on Fri, March 14th. Using the date drop down menu allows you to use this tool not only for today’s races but for days in the future. Finding the races that fit your schedule has never been easier. In addition to the time criteria, race conditions are also selectable in Race Finder. Use a narrow your focus by selecting more of our criteria to sort. 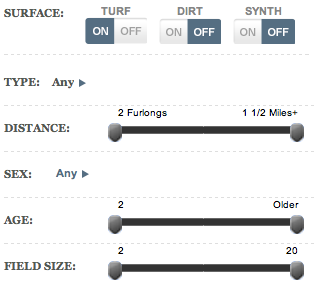 The example to the right shows the setting for 3 year old dirt races at 5-6 furlongs with a filed size of 8 or more. 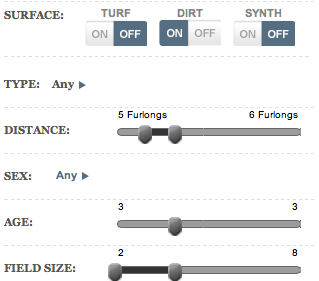 Or you can use a wider focus, shown below, finding just the turf races for the day. Once you have set your search criteria, hit the “GO” button in the bottom right corner to set the query in motion. If you need to reset the filters to the default of all races click the “show all” link in the upper right of the page. This page lets you pick the date and view all tracks running that day. Note that the weather listed for each track is just placeholder at this time. Additionally, the “A-Z” tab lists all tracks, and the other tabs (Most Popular, Recent, etc.) are still being developed so you should use the A-Z tab for now.